soil from geological profile - the wall is founded on the soil assigned from the geological profile specified in the "Profile" frame. input parameters of contact base-soil - parameters of the contact between footing bottom and structure are specified. Option "input angle of friction base-soil" requires inputting the friction angle ψ [°] between foundation and soil. Option "input friction coefficient" requires specifying the friction coefficient μ [-]. Both options require inputting the cohesion a [kPa] between foundation (base) and soil. strip foundation - strip foundation material is represented either by soil (input in "Soils" frame), or concrete - requires inputting the unit weight of foundation material γ and parameters of contact base-soil (friction coefficient f, cohesion c, additional resistance F). pile foundation - the wall can be founded on one row of piles or two rows of piles, respectively. 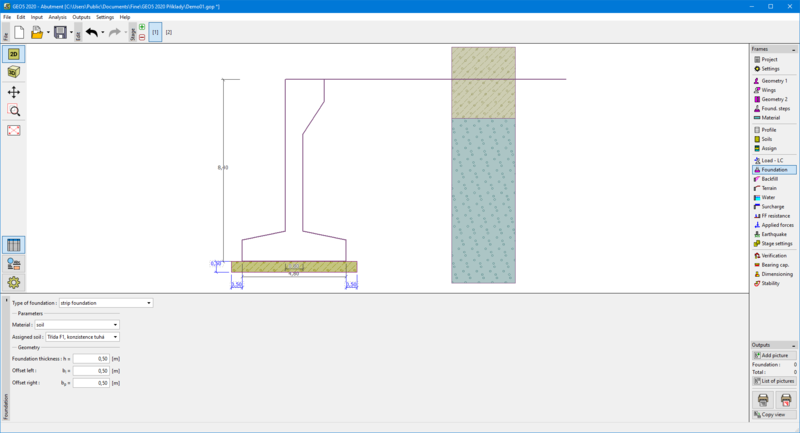 The geometry of wall foundation (strip foundation, pile foundation) can be modified either in the frame by entering specific values into the inputting fields or on the desktop with the help of active dimensions. The input data introduced in this frame influence the actual wall analysis (check for slip) and further the bearing capacity of foundation soil.